You know about me and brioche by now, we’re involved and it’s serious. I would normally be telling you to add absolutely nothing to the buttery perfection of a good brioche dough, why would you? But for those days when you feel like embracing a more is more attitude, give these babies a try. Crunchy pistachios and sweet tangy apricots manage to hold their own against the richness of the brioche, and they’re even better torn in half, smothered in jam and served as breakfast in bed. Brioche needs to prove overnight in the fridge, so remember to give yourself two days for this recipe. It simply won’t be rushed, it is French remember! you will need – four brioche moulds and a stand mixer with a dough hook. This recipe makes 800g of dough and for the four brioches à tête you will only need 480g which will leave you with the exact amount of dough to fill a 1lb loaf tin as well. Or you can always freeze the leftover dough for up to a month. Stir together the flour, salt and sugar in the bowl of your mixer and weigh out the yeast, keeping it separate for now. Beat the eggs and the milk together, then pour the liquids into the flour and lightly mix together. Now attach the bowl to the mixer, with the dough hook fitted, and start to mix on half speed. As soon as the mixer has started add the yeast and turn up to full speed. Leave the dough mixing for 10 mins, scraping down the sides of the bowl once or twice. Decrease the speed slightly, and add the butter in small pieces. This should take about 5 mins as you should make sure that the butter is absorbed into the dough each time before adding more. Once all the butter is in, mix for two more minutes on full speed. Turn the dough out onto a baking tray, loosely cover with cling film and place it in the fridge overnight to prove. The next morning, knock back the dough with a few gentle kneads, and weigh out the 480g that you will be using. Flatten out the dough, scatter over the chopped apricots and pistachios and then fold the dough in on itself to incorporate the fruit and nuts. Each brioche à tête needs two balls of dough, one large, one small. Weigh out and shape the larger balls first, each should weigh 85g. Drop these into your brioche moulds. Weigh out the smaller balls now, each should weigh 35g, but instead of shaping these into balls, roll them into small sausage shapes instead. Flour your fingers and push through the centre of the larger ball, hollowing out a hole in the middle, they should look a little like doughnuts at this point. Take your small sausage-shaped piece of dough and push this into the hole. Repeat with the other three moulds. You will now need to prove the brioches à tête for 40 mins in a warm place. Preheat the oven to 180ºC / Gas Mark 4. After proving, egg wash the brioche with beaten egg and bake for 25 mins. Allow them to cool in their moulds for five minutes and then turn them out. Done. 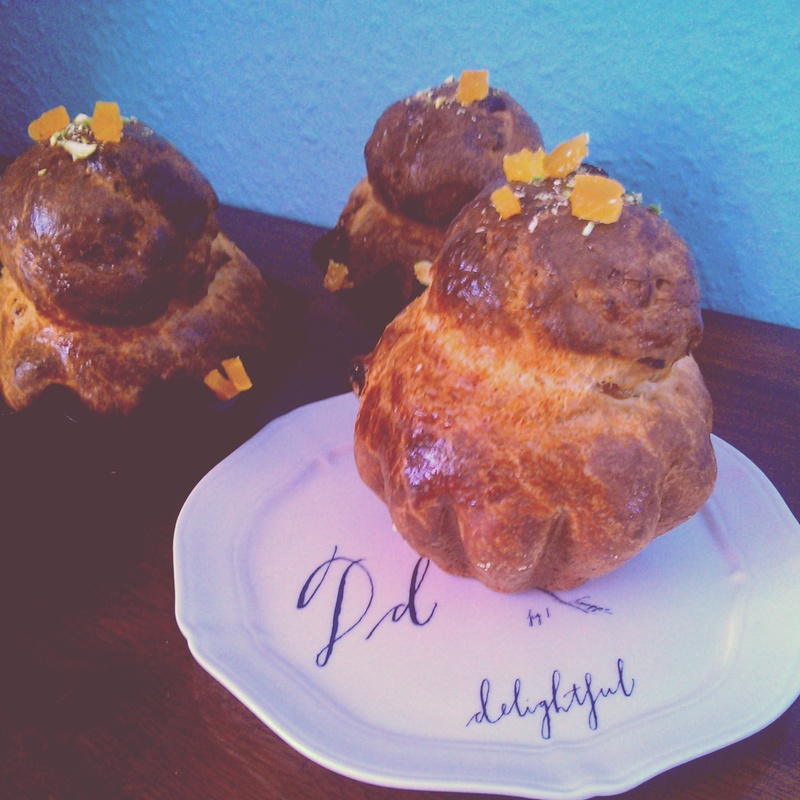 This entry was posted in Bread, French fancies and tagged apricot brioche, apricot recipe, baking, baking bread, Brioche, brioche a tete, brioche bread recipe, brioche recipe, French bread, French recipe by Natalie Glock. Bookmark the permalink. Love the addition of apricots. I already know these brioche as brioche parisienne but have never tasted them with the addition of apricots. This version sounds to be worth the try!